Binh Dinh has numerous famous scenic spots, including Nui Mot Lake, which is hailed as a wonderful natural picture with the blend of land and the sky. Located about 40 km from Quy Nhon city, the charming Nui Mot lake bends along the impressive An Tuong mountain, creating an open, peaceful space. 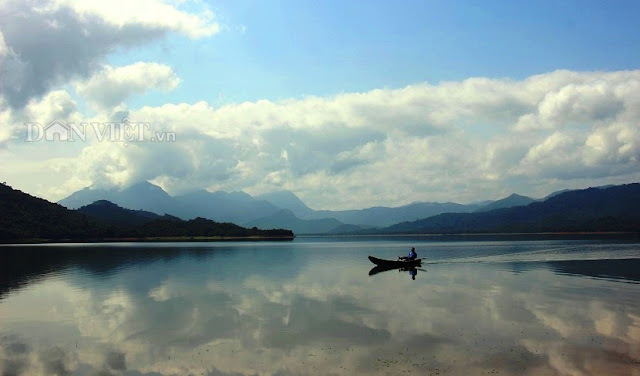 Many people have said that this western lake is like the blue eyes showing the youth and beauty of the soul of a Quy Nhon "girl" in the early days going to the city. The origin of the lake is a complex of wild, rugged mountains and forests. 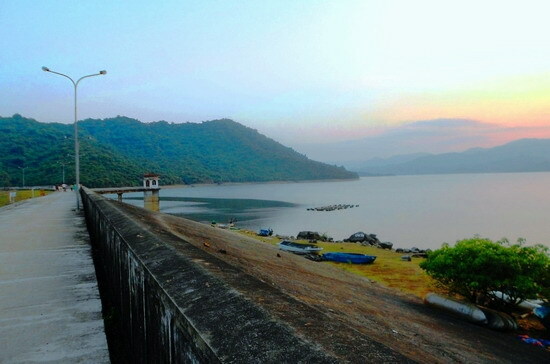 Since the eighteenth century, this Lake area was one of the important bases of the Tay Son insurgent army during the peasants’ uprising led by Nguyen Nhac. With rugged terrain, surrounded by an impressive mountain range shaped like a giant elephant prostrating, during the war against France, An Truong continued to perform the tasks of production, logistics for the army. During the war against American invaders, once again, the mountains of An Truong was chosen as the base for entire population, comprehensive, permanent resistance. In November 1959, the first officers of An Nhon district returned to An Tuong and selected this place the basis of the departments of the district. It was from here that revolutionary movement in An Nhon quickly got mature opening up a new era for the local revolutionary movement. People's Party and military of An Nhon, together with Binh Dinh province and the South have contributed to defeat American “special war”, defeat the Joint Warfare in South Vietnam, as a precondition for the next stage in the spring of 1975. After reunification day, along with guidelines to create a source of irrigation water for agricultural production, hundreds of local people joined hands, contributed to "tweak" a long dam of more than 30m high-striding An Truong streams (originated from Van Canh district) taking water to low-lying areas. Nui Mot Lake was also formed then. Not only Nui Mot Lake is large irrigation works of Binh Dinh province, it is also a big "basket" of fish. Annually, 30-50 tons of freshwater fish of all kinds are caught from the lake, creating permanent jobs for nearly 40 households in Nhon Tan Commune, especially people in Tho Tan Nam village. Passing the long slope leading to the banks of the dam, the green and blue of clouds, mountains stretching to the horizon make people forget all the tiredness. In the afternoon, the wind blows stronger causing immense small undulating waves. Some fishermen row to different directions to spread the net and catch fish. People in Tho Tan Nam in particular, and in Tan Nhon commune, in general, has associated with nets and catching fish job on Nui Mot Lake like a habit handed down from generation to generation. In recent years, the amount of fish in the lake has reduced, many people have chosen to go away, fish in the lakes in the provinces in the Central Highlands, or in Phu Yen Province. However, during the dry season, people going return to their "family lake" - as the way they use to call Nui Mot Lake. Visiting Nui Mot Lake, we will have the feeling that we are getting immersed in nature, enjoying great moments, flying between mountains and forests; therefore, all anxiety and sorrow in daily life will drift away in the water. With scenery bestowed by the Creator, Nui Mot Lake is currently one of the points with tourism potential waiting for investors who wish to turn this place into a tourist destination for recreation, entertainment.